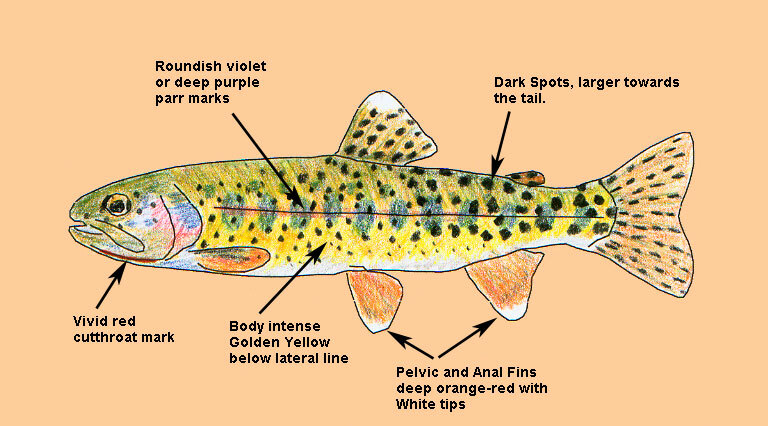 The Coastal Cutthroat (Oncorhynchus clarkii clarkii), is the smallest of the three varieties of sea-trout. The average Coastal cutthroat generally is about 1 lb. with 3 lbs. or more being quite scarce. Interestingly, this is about the same size as most river-run cutthroats and much smaller than cutthroats found in lakes. Cutthroat trout do not move far from their natal river estuary, preferring to stay close to the shoreline in less than 10 feet of water. They return to the freshwater in late summer and fall. They will feed in the river until they reach their spawing grounds. The cutts will remain within the River system for 4-5 months and return to the sea in April or May. They can spawn more than once. The name, Oncorhynchus clarkii clarkii comes from the Greek 'Onkos'(hook) and 'rynchos'(nose). Clarki is derived from Captain W. Clark of the Lewis and Clark expedition. Coastal Cutthroats resemble freshwater rainbows while in the sea. On returning to the river, the flanks turn to yellow-brown and the pale blue-green back turns a darker olive green. Spotting becomes more conspicuous and a faint orange on the throat becomes vivid rich orange-red.